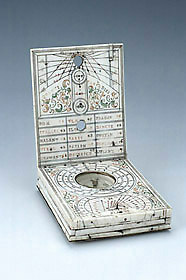 This dial is made of three layers of ivory, two of them folding, thus constituting a double diptych dial. One side is made as a common diptych dial, but the other has a brass folding universal equinoctial dial which can be adjusted for latitudes from 0 to 90?. On this side also the outer part of the folding leaf is covered with a gilt brass plate, with a pierced volvelle and aspectarium. There are signs of engraving on the ivory underneath the plate, so it was probably put there to cover a previous engraving.